This healthy, spicy take on popcorn is easy to make and ideal snacking material for anyone avoiding the biscuit tin. One serving provides 189 kcal, 9g protein, 19g carbohydrate (of which 0.5g sugars), 8.5g fat (of which 4g saturates), 7g fibre and 2.2g salt. Spoon the ghee into a roasting tray and warm in the oven for 1-2 minutes until melted. Pat the drained, rinsed chickpeas dry using kitchen paper and discard any of the loose skins. Mix all of the remaining ingredients together with the ghee in the bottom of the roasted tray until fragrant and well combined. Add the chickpeas and shake to coat them evenly in the spiced oil. Bake for 30-35 minutes, shaking the tray regularly to prevent the chickpeas from sticking to the bottom. 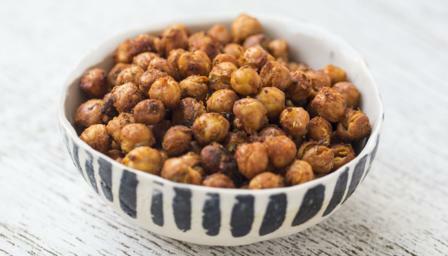 The chickpeas are ready when they are golden-brown and crunchy.